Possibly this is the first course of its kind because it contains a concise working knowledge of so many Natural Healing methods, as well as an explanation of energies and a very condensed method of knowing the self through Self Analysis. 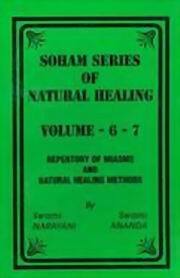 It is used extensively as an Alternative Healing method in many countries throughout the world. This teaching equips practitioners to treat patients in a holistic way, combining body, mind and soul - in other words, the whole person. In order to do this, the student, apart from learning the basics of the body, diseases and the remedies used to bring about healing, must learn to face himself through a system of self analysis so that he is equipped and centered to be able to teach his patient how to change his ways of thinking and living that is, to counsel him. In other words, in order to become a whole practitioner, you must first become a whole person within yourself. Side by side with these studies, you have to learn to heal yourself, following the words of the great Masters, "Physician heal thyself". Bibliographic Information: viii+32+iv+95p., Plates; Figures; Appendices; 22cm.